You can be pretty confident of the effectiveness of your advice. Further, if someone presents you with a cake, you can confidently infer the steps they had followed to bake it. If someone is better – does it mean they followed the steps to get there? And which approach characterizes trust? Strictly speaking, causality can never be proven. But casually, we infer it all the time. Tell any fool who doubts the power of causality to stick his finger in a flame and see what happens. We understand immediately that whipping egg whites causes a change in consistency, and that time-in-oven affects moistness and firmness. On top of that: if they go home and whip the egg whites and bake it just a little longer, they are very likely to get the same results you did. But if someone says to you, “Explain to me how you became a great person,” you might say, “A lot of suffering went into that.” Or, “I read the most amazing book.” That leaves a lot unsaid. First, a lot of people suffer without becoming great people. Suffering causes lots of things, becoming a great person being only one of many possibilities. Most importantly, does it mean that if you suffer, you will become a great person? Ditto for reading a book. Maybe that’s how you became great, but how does book-reading in particular cause greatness? And if I read that book, will I become great? Becoming a great person is probably more like learning to love, or to write a song. You have to learn to be open, to listen to others, to struggle to understand what others mean when they say something. You probably have to get in touch with your feelings, feel the feelings of others, sometimes give up control. For a million reasons, the dysfunction of our age is applying cake-baking solutions to great-people problems, rather than the reverse. A lot of advice, wisdom and selling in this world exemplifies that dysfunction. But it’s hardly unique to training. Think of most self-help books, and an extraordinary number of blogposts and magazine-rack tabloids. How many books do you know that propose to identify the X most critical determinants of a successful company? Can you say Good to Great? In Search of Excellence? Cake-Bake Great People? Or Be Great Cake Bakers? There’s value in both approaches. But we need to be balanced about it, and as I said above, the greater danger of our time lies in mechanist explanations. Take trust, for example. Here are two contrasting approaches. Fair enough. Of course, few companies set out to produce low quality products or treat employees badly. But there’s value in forcing them to compare their data with others. And the list of 16 as a whole tells a story, as opposed to other lists that might have been created. More critically, though, is how the information will be used? Will it be deployed in project management fashion, assigning someone the job of treating employees better so that trust can be improved? Or is the value more heuristic in nature, making for richer discussions? In complex cases like trust, the latter is more clear. 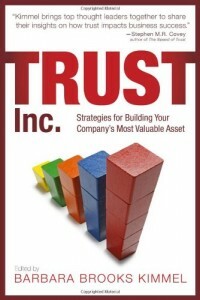 When it comes to trust, the value of metrics lie in getting us to think, rather than to task and manage. Even then, thinking alone is not nearly enough: trust also requires a bit of heart. So do a lot of things. Not all life is like baking a cake. http://trustedadvisor.com/public/trusted_advisor1.png 0 0 Charles H. Green http://trustedadvisor.com/public/trusted_advisor1.png Charles H. Green2012-08-13 06:01:202012-08-12 15:27:55Is Building Trust More Like Baking a Cake, or Like Being a Better Person?